Surprise! Bet you didn't see this one coming ;) Five giveaways were not enough for my awesome readers, so I'm back with a surprise 6th giveaway tonight! 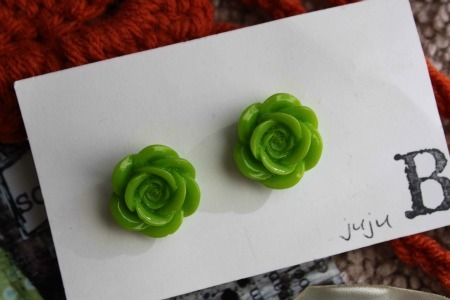 Giveaway 6 comes from Becky and Juliana of jujuB. "We are jujuB! Just two friends and neighbors who LOVE to craft. Okay, we don't just love to craft, we are kind of obsessed with it. We get together just to craft at least once a week. Truthfully, since we started jujuB we do it way more than that, but I don't want to sound so obsessed that you think we are crazy. :) Ok, I, Becky, am a little crazy, and Juliana is what keeps us all together. That's why we are such a great team! Check out our blog to see what we are up to--and we are always up to something!" 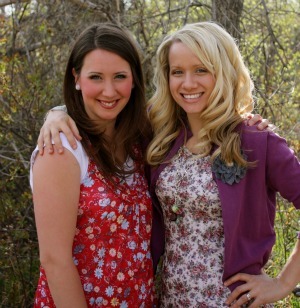 These ladies have a cute blog with some really neat tutorials. Make sure you check out the popsicle Halloween costume :) and my personal favorite, their jersey rosette bracelet tutorial. Thank you so much Juliana and Becky for offering up these pretties :) This could be an early Christmas gift for yourself or gift it away to someone else! Ready to enter? Mandatory entry: Visit the jujuBstash shop, then come back here and leave one comment on this post telling me your favorite item in their shop. They have some really cute gumball necklaces for little girls. Optional extra entry (must complete mandatory entry above first): Add the jujuBstash Etsy shop to your Etsy favorites and leave one additional comment below letting me know that you did. That's up to two entries per person. Make sure you either leave an email address in your comment or that your email is attached to your Blogger profile. If I don't have a way to get in touch with you, I will choose another winner. This giveaway will be open until 11:59pm (EST) on Sunday, November 20th. The winner will be chosen using a random number generator. I will announce the winner on Monday, November 21st, and they will have until Wednesday, November 23rd at 7:00am (EST) to respond before I choose another winner. Thanks again to Juliana and Becky! Good luck everyone! My favourite item is the crocheted headband. Very pretty! Thank you for the generous giveaway. 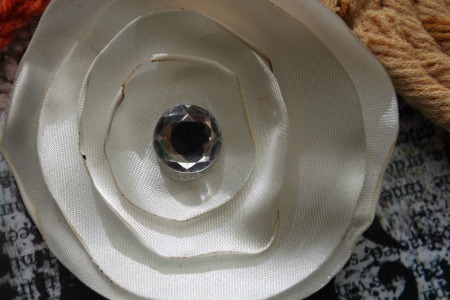 I love the fabric rosette bracelet- the black and white one- beautiful! They have lots of really pretty things in their Etsy store. I added their Etsy store to my favorites. I love the Jersey Rosette Bracelet! Too cute! I love the pretty pink posy clip! I am loving the silk peony flowers and the flower earrings. Also the headbands. Everything is so cute! And I added their shop to my Etsy favorites. love the jersey rosette bracelet! My favorites are the Large Felt Dahlias in Black, Red and White. Lovely! I like the fabric rose bracelet very much! I like the fabric rose bracelet! Thanks for spoiling us with another giveaway!! What a beautiful shop these women have on Etsy. My favorite is the crocheted headbands....perfect stocking stuffer for my college daughter. Thanks for the surprise #6 giveaway. Since my daughter in law can't get my grandson to wear slippers......I think she could definitely bribe him with "The Cars" pair. As a two year old....he would probably even sleep in them. Thanks for the pointing out such a great Etsy shop. I have added them to my Etsy shop favourites! 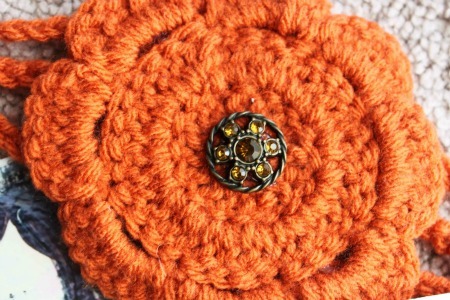 FLove the jersey rosette bracelet. I love the crochet headbands! I like the jersey bracelet and the headbands. I added their shops to my favorite! Love the winter frost watch band. Very cute and chunky. Love! Such cute headbands,clips, and rosette bracelets, but the Yellow Meringue watchband caught my eye. Fun! 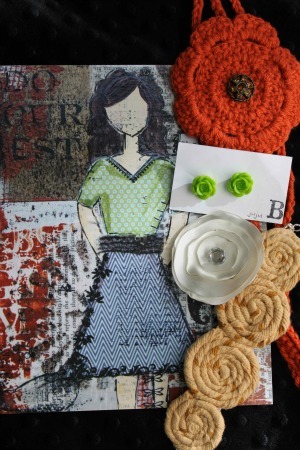 The black & white Fabric Rosette Bracelet is my pick. Although the Fabric Posy Flower Hair Clips (red one) is a close second. My favorite thing from their shop is their mustard yellow crochet headband. I love their shop!!!!!! Those crochet headbands are ADORABLE. I wish I could crochet!! How fun! I love the blue, pink, and black necklace. Super cute. Thanks for the chance to win! I've fallen for the elephant minky blanket. So sweet! Oh my goodness I love it all but I will narrow it down to 3. The Christmas Bell Gumball Necklace, the Dahlia Brooches and Hairclips and the Holiday Watch Bands. OK, I added them to my favorites on etsy. Good luck all.